On my blog, Fritinancy, I’ve been documenting the commercial use of vulgarisms and near-profanity for several years. I’ve written about Effen vodka, “Look at the booking view,” “half-fast Internet,” “go fun yourself,” and other examples of boundary-pushing by advertisers. But until earlier this month I’d never encountered “piss” in a national advertisement. Ad for S.J. Shrubsole, The New Yorker, December 8, 2014, page 21. The use of the earthy “haven’t got a pot to piss in” caught my eye, especially because of the contrast with the $125,000 chamberpot. (Some pot! Some piss!) I wondered about the idiom–how old is it? American or British?–and about whether attitudes toward this particular four-letter word, one of the infamous seven you can’t say on television, are shifting. Some piss– compounds are almost as old as the original word. Pisspot goes back to the mid-15th century; piss-burnt (discolored by urine, which was often used in tanning and dyeing) dates to the mid-16th century; piss-prophet (one who diagnosed diseases through examination of urine) and piss-house (a privy) appeared in the 17th century; piss-proud (having or designating an erection due to a full bladder) is from the late 18th century. But a significant number of piss idioms were coined in the 20th century. Piss and vinegar (energy, vigor) is “chiefly U.S.” and not documented until 1936. According to Michael Quinion of World Wide Words, the poet Ezra Pound invented piss-rotten (“distasteful or unpleasant”) in 1940. The earliest documented use of piss-poor (“of an extremely poor quality or standard”) is dated 1946; its military context–“Jim Constantine (..formerly sergeant in Air Corps in West Indies) told me this morning that this word was used by all the soldiers he came in contact with as descriptive of a thing in its lowest condition… E.g. This is a piss-poor outfit. My job is a piss-poor one”–suggests that the term had been in circulation during World War II. Piss-elegant (“affectedly refined”) was first recorded in 1947. To piss away (money, for example) is from 1948. The OED gives the first usage of the British to piss off (“to go away”) as 1958; the U.S. version (“to annoy”) is documented from 1968, although it’s said to have been in use during World War II. Ditto for to take the piss out of (someone), a British (and Commonwealth) idiom meaning “to satirize,” which first appeared in written form in 1945. Before the days of indoor plumbing, bedrooms were equipped with chamber pots, wide-mouthed vessels used by the room’s occupants as ad hoc toilets during the middle of the night. (Once bodily contributed to, such containers were covered with cloths, placed back into the cabinets (commodes) they’d come from or slid under beds, then retrieved in the morning and emptied into the home’s privy.) While this colorful phrase deals with a houseware item common for centuries, the saying itself dates only to 1905. However broke people may have been in the more distant past, there weren’t hordes of them unable to afford vessels of any kind to pee into. In the world of branding, vulgar terms for excretory functions appear more frequently, and in odder contexts, than you might predict. There are a bunch of brand names with slang terms for defecation: see Chicken Poop Lip Balm, Poo-Pourri toilet spray (famous for slightly surreal commercial spots), and competing cereal brands called Crapola! and Holy Crap. By contrast, piss brands are relatively scarce. I found only Piss Beer, from Australia (the URL is euphemised to Pi55.com) and the evocative Piss Off, a “shampoo and conditioner” for wetsuits that may have been worn for a few hours past holding capacity. Back in the ’80s, I would sometimes watch the late-night ramblings of Dr Gene Scott, the sunglass-wearing Christian televangelist who would yell at the TV, smoke cigars, play saxophone, read from books, and just generally be amusingly nuts. One night I was surprised to see the band playing a song, “Kill a Piss-ant for Jesus,” while the camera panned around a large painting depicting the little creatures. I understand it is a common name for a type of ant in addition to a pejorative, but it still slightly shocked me — not only the insanity of it, but that this “man of God” would use that term, and that I would hear it on TV. Even Christians need to piss occasionally. 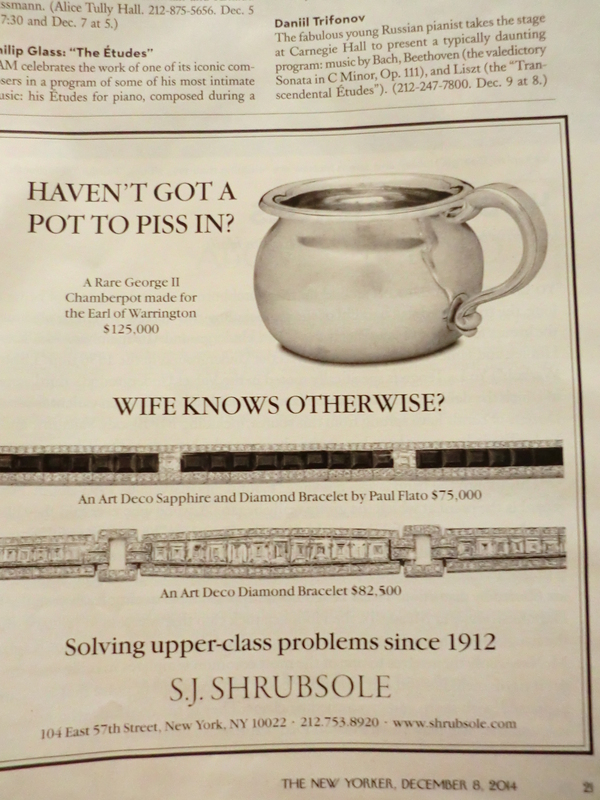 Let’s not forget about the best part of the ad: “Wife Knows Otherwise?” Which posits the chamberpot not only as a utilitarian vessel but also a way to hide other assets in anticipation of a pending divorce settlement. The King James usage is a literal translation of a common Biblical Hebrew expression usually referring to a male person. The typical BH usage is in a passage indicating that every last male person in a place will be killed, so that there will not be left a single one who pisses against the wall.